Hearing loss can affect anyone at any point during a person’s life. The extent of any individual’s hearing loss will vary widely from person-to-person and can be triggered by a number of environmental or biological factors. Hearing loss is also incredibly common, with an estimated 48 million American reporting some degree of hearing loss. Even understanding that hearing loss can occur at any time, many people struggle to identify their hearing loss. Here at the Hearing Associates of Las Vegas hearing clinic, we have had countless people express surprise at the extent of their hearing loss after we have tested them. As hearing loss is a gradual process in most cases, it can be easy to miss the starting signs that hearing loss is happening. To help you identify hearing loss in either yourself or a loved one, we wanted to comprehensively cover hearing loss, the types of hearing loss, potential risk factors for hearing loss and more. Hearing loss is when you lack the ability to hear the full decibel range. Those with intact hearing have hearing ranges from 0-140 dB. To give some insight on what this means, the average human whisper is 25 dB, and hearing damage can start occurring at frequent exposure to 80 dB and above. Depending on what part of the ear is affected, individuals will experience different types of hearing loss. There are three main types of hearing loss: conductive, sensorineural, and mixed hearing loss. For those dealing with conductive hearing loss, sound waves are unable to be transmitted through the outer ear and/or middle ear. 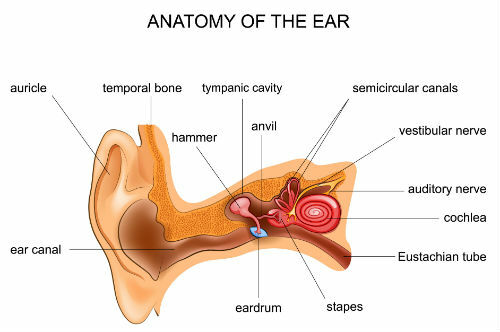 This disruption in transmission can be due to damaged eardrums, issues with the delicate bones of the middle ear (stapes, hammer, anvil) or other problems in these areas. However, the inner ear works correctly. This kind of hearing loss is more common in children but can occur in adults. Surgeries such as eardrum repair or cochlear implants can help overcome some cases of conductive hearing loss. Opposite of conductive hearing loss, those dealing with sensorineural hearing loss have suffered damage to their inner ear. Often, this damage is to the sound transmitting hairs in the cochlea. This type of hearing loss is very common as it can often occur as the result of noise damage. While there is no surgery or medication which can repair sensorineural hearing loss, individuals can bypass much of the damage when they use hearing aids. By using hearing aids, sound can be greatly amplified so the cochlea can detect and transmit the sounds to the auditory nerve. Mixed hearing loss is when an individual suffers from both sensorineural hearing loss and conductive hearing loss at the same time. To overcome this kind of hearing loss, both surgery and hearing devices are typically utilized. As hearing loss is gradual in most cases, it can be difficult to identify if you are experiencing hearing loss. There are some signs you can watch for if you are concerned that you or a loved one is struggling with hearing loss. The TV and other media devices are often at or near the max volume. Heightened tinnitus symptoms where the constant sound impacts your quality of life. Increased discomfort with social situations due to the inability to catch all of the conversations. Experience audio disorientation when in busy areas such as malls, restaurants, and family get-togethers. Difficulty hearing consonants, and with speech in general being muffled. If you suspect you or a loved one may have hearing loss, our hearing experts provide a comprehensive hearing test as one of our many hearing services. With our hearing evaluation, our hearing specialists can pinpoint the extent of your hearing loss and offer you the appropriate treatment options. There is a wide variety of hearing loss risk factors. Some are more common than others, and many are preventable. Noise Damage – By far, hearing loss as a result of noise damage is the most common risk factor. It can be easy to damage our hearing with loud noises as the process is generally gradual. Prolonged exposure to sounds at 80 dB and above can damage the delicate hairs in your cochlea, causing sensorineural hearing loss. Cerumen Buildup – It may seem surprising, but cerumen (earwax) can build up enough to cause profound hearing loss. For help managing your cerumen, our hearing clinic offers cerumen removal so your ears can be safely cleaned out. Ruptured Eardrum – Improper at-home cerumen removal can result in a ruptured eardrum. It is also possible to damage your eardrum with a blast of sound, infection, and pressure changes. When the eardrum is ruptured, you will suffer from conductive hearing loss. In some cases, the eardrum can be repaired or replaced. Genetics – There can be a hereditary factor in hearing loss, making you more prone to hearing damage or age-related hearing loss. If hearing loss is a known factor in your family, you may want to start hearing evaluations in your 50s. That way, you can catch any hearing loss quickly. Ear Infection – Repeated ear infections can leave scarring on your eardrum and pressure issues in the middle ear. Surgery to place tubes in the eardrum can help correct this issue as can eardrum replacement. Medications – Over 200 medications are ototoxic, which means they can damage your hearing. Sometimes the hearing loss is temporary, such as the hearing loss caused by pain-killers like aspirin. However, some chemotherapy drugs can cause permanent hearing loss. If you are concerned, be sure to ask your prescribing physician if the drug is ototoxic. Illness – Many illnesses and diseases can affect your hearing, such as diabetes, high blood pressure, meningitis, and other illnesses. Hearing evaluation – Our hearing specialists can pinpoint your level of hearing loss with their comprehensive hearing evaluation. 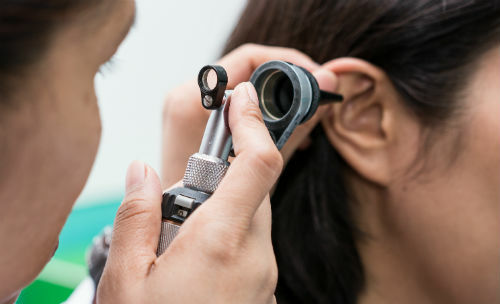 This in-depth testing allows them to advise you on what will best help you regain your hearing. Hearing aids – Since our hearing clinics are entirely independent providers of hearing instruments, we carry a diverse stock of hearing aids for you to try. You can trust that the Hearing Associates of Las Vegas will always recommend the hearing aids which are right for you. Aural rehabilitation – For those who experience hearing loss for a long time before receiving hearing aids, it can be tough to readjust to the world of sound around you. Our hearing specialists will help you develop techniques to help you make sense of the sounds around you and assist in improving your communication skills. Tinnitus treatment – Those suffering from chronic tinnitus often usually have a certain amount of hearing loss. We have a wide variety of tinnitus treatment and management tools available to help you move beyond your tinnitus. If you are ready to take control of your hearing or help a loved one receive the best hearing possible, contact us to set an appointment.